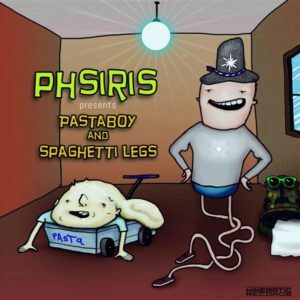 Phsiris presents Pastaboy & Spaghetti Legs, a twisted collection of night-time psytrance tunes released by Kinematic Records, Australia. This four-track release is quirky, irreverent, and unafraid of being different, which is just the way we like it! Masses of melodies and whacked-out sound design take these songs beyond the usual night-time vibes into very original territory. Pastaboy and Spaghetti Legs are here and we’re pretty sure things will never be the same again! Mastering by Terrafractyl with artwork by Clint Grierson @ Point Zero Productions. Okkkk! !That’s some proper stuff!!! !Great sound and themes all the way !! !Hard to decide but i think Hamster Boy my fav :D !! Nice work Phsiris! Greetings to all from the other side of Australia! Melodic yet phat as a hamster on a bacon diet! Trascendant pig is redonkulously sweet. Oi “The other Beau”, you wanna go me? “Beau” Wot’s that mate? Me mum?